Hi Support - I did a Boxifier update and am now getting a message saying “Dropbox Version 37.4.29” is not supported. Within Dropbox account I have disabled “Early Releases” as you suggest so i am assuming this must be a legitimate Dropbox version? Boxifier won’t work with Dropbox 37.4.29 so doi I just need to wait for the next Boxifier update to use it again? Dropbox 37.4.29 is supported by the version of Boxifier that you have installed, so probably the installation of Boxifier is partial? Our customer support team has contacted you to investigate this. Hi Just wondering when this will be supported? If you already installed Boxifier 1.6.11 and you are still receiving the not-supported message, please report back here. Hi. I have been getting an error for a while and now need address. 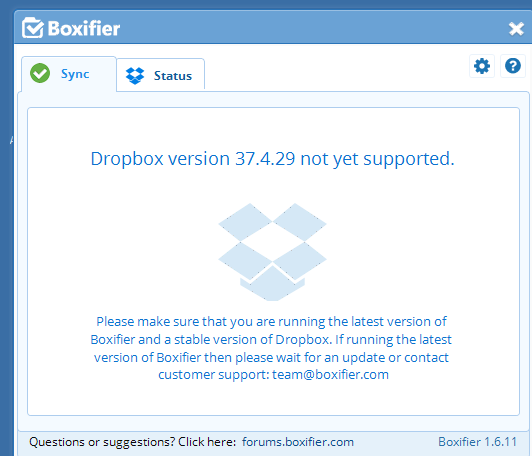 It reads that dropbox version 35.4.20 is not yet supported, and there’s an old version of Boxifier that keeps asking to be installed but seems not to install (1.6.11). What do you suggest? Did you try installing the latest version from the Boxifier website? Does it show any error when it seems not to install?